Food hacks are hugely popular and I’m nothing if not opportunistic so I’m going to jump right on that bandwagon and ride it all the way to Internet Famous. Here goes! If you eat biscuits and gravy like this you’re doing it like a sucker! Yep. Just flip both halves over. It keeps your gravy warm. Simple but genius. 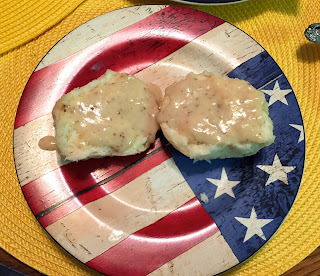 Seriously, I'm not sure this qualifies as a “hack” but it really is an easy way to make your biscuits & gravy experience even better. Give the Tennessee Way a try. You might get some funny looks from your breakfast mates but screw them; you’re the one eating warm gravy.